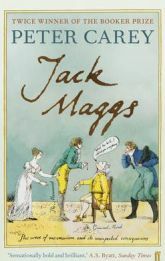 Jack Maggs is a criminal – a convict shipped away from England to Australia for his crimes, who returns to his native 19th century London to contact one Henry Phipps. Henry was an orphaned boy who showed Maggs a small kindness just before his exile, and whom Maggs has been secretly financially supporting from afar. Maggs returns to England, despite personal danger, so he can finally reveal and explain himself to his “son”, Phipps. Does this sound at all familiar to you? Anyone read any Dickens, perhaps? Maybe you read Great Expectations? Maybe you recall a minor character that plays a major but secret role in the life of young Pip? Do you recall the convict called Magwitch? Think that there are some parallels here? Pip and Phipps, Maggs and Magwitch – two stories taking place in the 19th century dealing with convicts, orphans, exile, secret financial support and painful revelations. But the difference here is that this story isn’t told from the side of the growing and prospering lad, but rather from the part of the convict who returns to reveal himself to the young man that once aided him in his hour of need. Now think about that plot line for a just moment. It’s as if Mr. Carey decided to tell the part of Great Expectations that Dickens left out of his novel. If you ask me, I think it almost borders on genius, actually. Unfortunately, great ideas do not always reap great novels, and unfortunately this is an example of just such a situation. Thankfully, you won’t feel like you’re reading Dickens as Carey doesn’t try to imitate Dickens’ style or language. Instead, he uses clues and references to 19th century England in order to give the flavor of the time. Too many times modern novels seem fake and artificial because the authors tried too hard to make their writing into a literary time machine, and failed miserably, so all kudos for Carey in this aspect. On the other hand, the focus of this story wasn’t quite right. We seem to be led in one direction and then are veered off elsewhere and never seem to get back to that original track, seemingly leaving loose ends. While hindsight shows us that some of the loose ends do get wrapped up, they certainly don’t come to any type of logical conclusion. For example, at the very beginning of the book there’s a scene where Jack visits the home of a woman and has heated words with her and then threatens to return the next day for satisfaction. Carey then tells us that Jack didn’t return the next day, but rather it took him several weeks to return. Now we do find him returning later in the book, but the events of his return are not to conclude the dispute but rather for something else altogether. The whole conflict with this woman is dropped and never returned to. In this way, we are given clues that lead us down dead end streets, in an unsatisfactory way. Carey also seems to cheat the reader with how he drew his main character, Jack Maggs. While we get a good deal of his background by the very clever device of having Jack write his memoirs to his unsuspecting ward, there are still many holes in his history and personality. What’s more, Jack acts uncharacteristically in several instances. Mind you, this isn’t all bad, since it suggests a person who is complex, unpredictable and possibly very deep, which would generally fit the mold that Carey has forged for us. However, some things are just not feasible. For instance, how does someone who started his criminal life as very young boy who probably never had time for schooling, not only learn to read and write perfectly, but can pen his memoirs in mirror-writing, like Leonardo DaVinci? Furthermore, he’s doing it with a special fading ink that needs to be washed with lemon juice and then heated by a flame in order to be restored. Where exactly did this criminal learn these tricks? Carey also seems to get overly involved with some of the characters that are supposed to be minor ones. This isn’t totally disturbing, because Maggs is particularly unsympathetic, and these distractions are actually pleasant ones. But if Maggs is supposed to be the focus of the book, why then do we feel we understand some of these minor characters more fully than Maggs? Perhaps this was another one of Carey’s ways of keeping Maggs enigmatic, and therefore interesting, but it also makes the book feel confusing. While highly flawed, Carey has given us a fascinating story line, a truly colorful cast of characters that are multi-dimensional, and a setting that is brooding and yet romantic, all written in a style that is both accessible and clear. With these pluses it is no wonder that Carey has found himself no small number of faithful fans. But for my part, my opinion of this book was that it wasn’t completely polished, left too many questions unanswered (some questions can be left to one’s imagination with great effectiveness, but not as many as can be found here) and seemed a bit distracted and unfocused. Even for those who are Carey fans, this is a book to be borrowed, rather than purchased – a disappointment that gets only two stars out of five. No Comments on "Jack Maggs"